When an MMA Fighter Shared the Book of Mormon on TV After Winning "The Ultimate Fighter"
Brazilian mixed martial arts fighter Diego Pereira Brandão is fearless when he steps into the cage, but he is also fearless about sharing his faith. Take, for instance, the moment he shared his testimony of the Book of Mormon on national television right after winning The Ultimate Fighter. In 2011, Brandão participated in the 14th installment of the reality TV show The Ultimate Fighter, which pits the best MMA fighters against one another to determine who is the toughest. After making it through the tryouts followed by three rounds of fighting, Brandão made it into the final matchup for the featherweight division. In what was awarded as the "Fight of the Night" and the "Submission of the Night," Brandão beat his opponent Dennis Bermudez by submission with 15 seconds left in the first round. At the height of his incredible victory, Brandão focused little on his skill in his post-fight interview. Instead, he talked about his family and faith. "I want to thank God . . . without Him, I can do naught," Brandão says, adding that he was going to buy his mother a new house with his winnings. "I have been praying, I have been praying so much," he adds, sharing how this moment became possible. After noting Brandão's up and down career, the interviewer asked Brandão where his recent confidence came from. That's when Brandão picked up his copy of the Book of Mormon. "From this," he responds. "Everything is coming from here. This changed my life. God, He said He had a plan for me . . . everything that is hard in my life, He made it so easy." About his remarkable win on the show, Brandão says, "This is God, it's not myself." The moment that sums up the interview the best is when the camera pans over to Brandão's trophy. 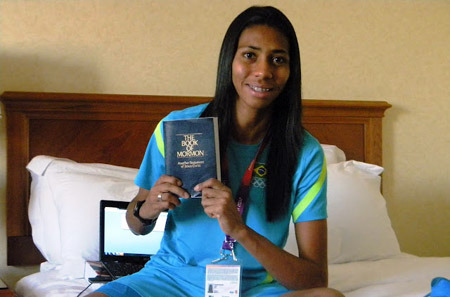 Directly in front of the trophy is a copy of the Book of Mormon, showing where Brandão places his priorities.